As the leaves fall and the mercury drops, the Gatlinburg area starts gearing up for the holidays. Join us this November for fun & frolic sure to put you in a festive mood! 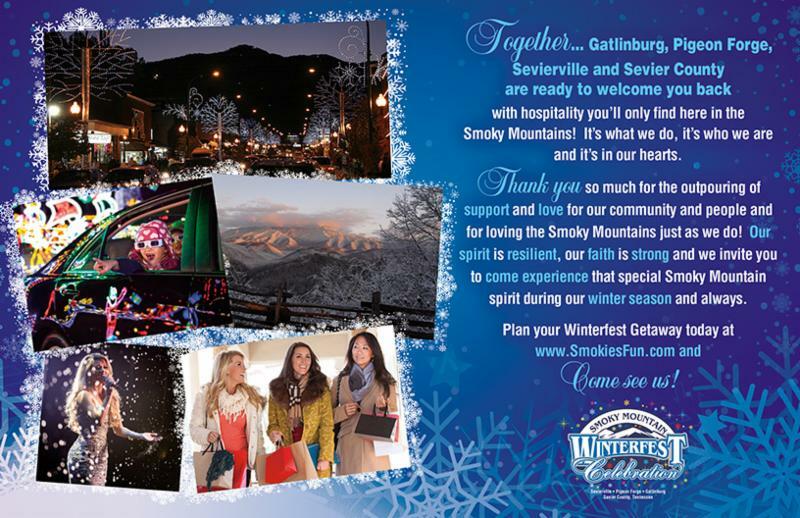 The excitement begins on Wednesday, November 9, between 5 and 8 p.m., when the 27th Smoky Mountain Winterfest opens with its annual Gatlinburg Chili Cookoff and Winter Magic Kickoff. Mosey on over to downtown Gatlinburg to sample hot bowls of mouthwatering chili and enjoy live musical entertainment. Plus, don’t miss the ceremonial lighting of more than three million Christmas lights throughout the city - the official launch of Winter Magic. Speaking of lights, how would you like to enjoy Gatlinburg's dazzling display in cozy, relaxing comfort? It's easy... just take the Winter Magic Trolley Ride of Lights. Departing from downtown Gatlinburg every evening between November 9, 2016, and January 31, 2017, specially designated trolleys roll through an LED-lit wonderland of sparkling fantasy forests, festive snow scenes, dancing fountains, and much more. It's a favorite holiday tradition, sure to enchant your entire family. In nearby Pigeon Forge, Dollywood's Smoky Mountain Christmas offers more than four million Christmas lights, scrumptious food galore, and fabulous live entertainment. This year the fun includes a special interactive visit with Rudolph the Red-Nosed Reindeer, featuring all the characters from the beloved TV special. Plus, a popular annual tradition continues with Dollywood's A Christmas Carol, an award-winning show featuring amazingly lifelike holograms. Presented by Humana, Dollywood's Smoky Mountain Christmas runs from November 8, 2016, through January 3, 2017. Planning to visit around Thanksgiving? Check out the annual Great Smoky Thanksgiving Arts and Crafts Show, running from November 22 through 27 at the Gatlinburg Convention Center. Here you can shop for exquisite crafts handmade by members of the Great Smoky Mountain Arts & Crafts Community, the largest independent artisans’ organization in America. You’ll discover everything from hand-sewn quilts to one-of-a-kind jewelry, from authentic mountain pottery to beautiful painted landscapes... and much more. It's a great opportunity to find truly unique holiday gifts for everyone on your list. At the same time, don't miss Gatlinburg’s Festival of Trees, also running from November 22-27, at the WL Mills Conference Center. Here you'll enjoy live entertainment, visits (and photos) with Santa Claus, plus a magical array of beautifully decorated Christmas trees. It's the perfect way to ring in the Christmas season. And, best of all, all proceeds go to benefit Boys & Girls Club of the Smoky Mountains. After a full day of festive fun, you'll want to relax and unwind. And what better setting for relaxation than a cozy Smoky Mountain cabin? Here at Volunteer Cabin Rentals, we offer a wide array of comfortable cabins, complete with amenities like hot tubs, fireplaces, big-screen TVs, and full kitchens. All cabins are located in beautiful Wears Valley, just minutes from Gatlinburg and Pigeon Forge. Book your November rental today!